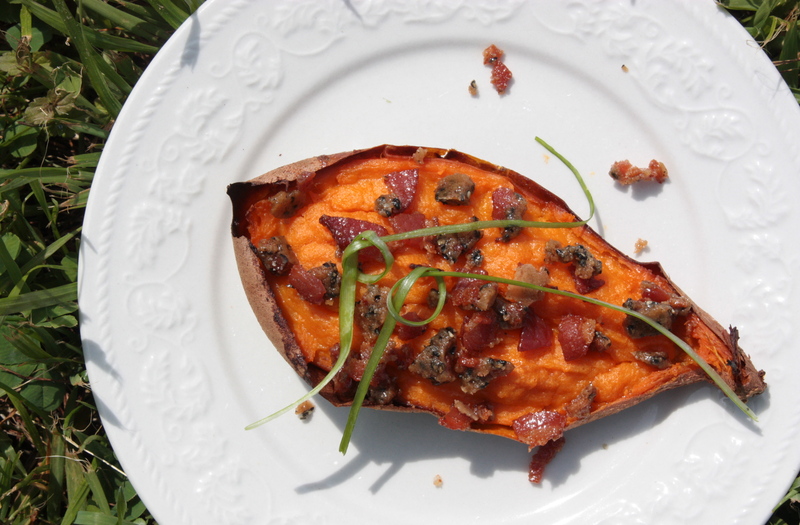 Twice-Baked Sweet Potatoes with Bacon-Sesame Brittle | "Il faut goûter"
Happy Easter, Happy Spring! It’s sunny out, and I’m barefoot and loving life today! As a gift this Christmas past, Mom got me a 2-year subscription to Bon Appétit. It’s such a treat to pull a magazine out of the mailbox every month–especially one with gorgeous food inspiration! 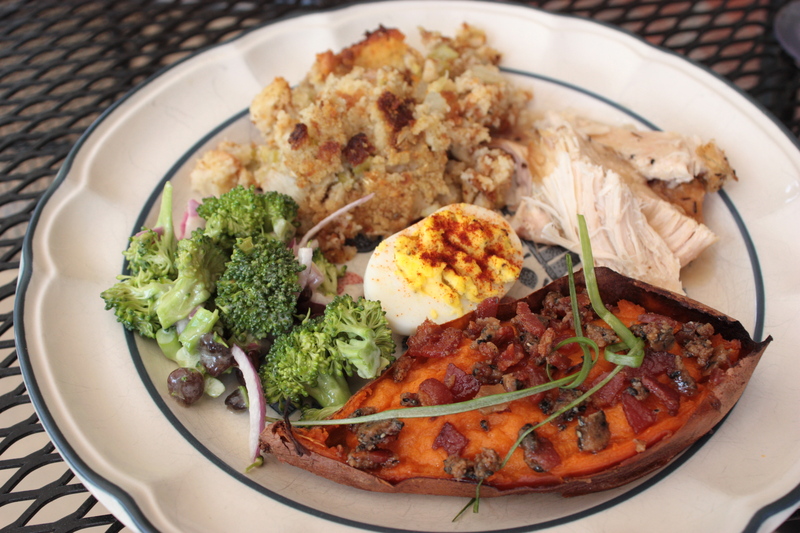 This Easter day I made these Twice-Baked Sweet Potatoes inspired by a recipe from the March 2012 issue. I’ve been thinking about that recipe ever since I laid eyes on the photo and realized those sweet orange potatoes were topped with, basically, bacon candy. That’s just too fun. So while the potatoes were roasting I cooked up the bacon and set about making the “brittle,” which consists of bacon, drippings, sugar, and sesame seeds. Perhaps I didn’t cook the mixture quite long enough, or the BA writers didn’t explain the process in enough detail–I ended up with sugary candied bacon rather than shiny glossy brittle. But I don’t mean to say at all that the recipe was a flop-oh, no-it was still a grand success! While the texture of the topping is slightly off from what the recipe intended, it’s still an ingenious sugary bacon topping–with added toastiness from the sesame seeds–that makes an exquisite accent flavor for sweet potatoes. The flavors are great, the textures are fun, and the presentation is just so nice. Go ahead, fancy up your sweet potatoes. And if your brittle turns into candied sesame bacon, fear not, for you have not failed. Just take a bite. Easter in food, 2012. There in the middle is the only Easter egg I saw today. Preheat oven to 400 F. Place sweet potatoes (whole) on a foil-lined baking sheet. Roast until tender, 45-55 minutes. Let sit until cool enough to handle. When cool, slice potatoes in half lengthwise. Using a spoon, scoop most of the flesh from each half into a bowl, leaving 1/4 to 1/2 inch layer of flesh inside skins. Mash potato flesh in the bowl with the egg, butter, ginger, salt, and cinnamon–stir until smooth. Spoon or pipe filling back into reserved skins on the baking sheet. Bake potatoes until the tops are lightly puffed and golden brown, 30-35 minutes. To serve, top with bacon-sesame brittle and super thinly-sliced green onion ribbons. This entry was posted in Savory and tagged Bon Appétit, Cooking, Easter, food, Holiday, recipe, recipes by needtotaste. Bookmark the permalink. Potatoes were wonderful, Al. Perhaps Bon Appetit should make their bacon bits like yours. I love this idea. We love sweet potatoes in our house and this is one way we’ve never cooked them. Thanks for the inspiration. Hope you try them–and please let me know if (and how) you master the brittle-making process! That is one good looking plate of food.